When I was a teen, there was no concept of face cleansers, non soap face washes, and foaming face washes for different skin types. People used the same bathing bar for cleansing their face. Sounds scary! It was Pond’s that launched its first face wash in India and brought a revolution in face cleansing regime. Now there are cleansers from different brands, face washes for different skin types, foaming face gels for day and night and so on. You think of it and they have it. As summer is upon us, my skin has caught up with its usual oiliness and dullness. While, watching one of Pond’s cleansers ad with activated carbon on TV the other day, reminded of how Pond’s has always stood me in good stead. I was drawn to buy this Pond’s Deep Cleansing Facial Foam with activated carbon to make my skin get rid of all the ‘black’ dirt, grime, and impurities. The logic behind this Pond’s face wash is ‘black attracts black’. This is the first face wash with activated carbon technology known to attract all the deep seated “black” dirt caused by impurities, oil, and makeup to reveal a pure white you. So despite knowing this pure white deep cleansing facial foam from Pond’s dries out the skin a bit, I got this face wash for the lure of clean, white and radiant skin. I can always combat dryness with good moisturizing. 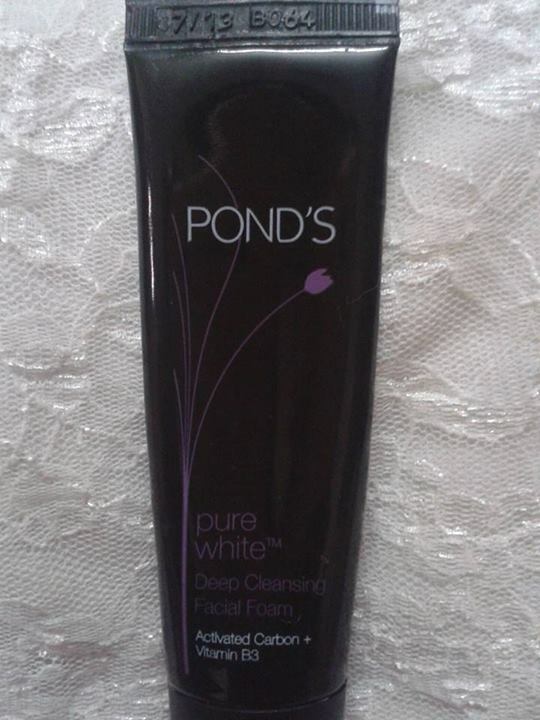 Now read the review to know more about Pond’s deep cleansing face wash. 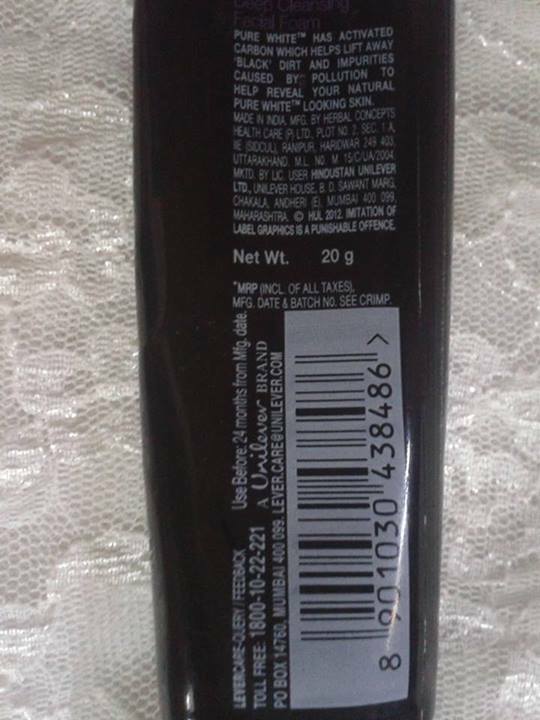 The face wash comes in a sleek black glossy tube with slightly pink and white font. The flip open cap makes it spill proof and easy to use. It is pearly grey in color with a mild flowery scent. What I liked the most about this face wash is it is creamy in texture with no micro-beads or scrubbing particles. I hate products with micro-beads as they tend to irritate my ultra sensitive skin. The face wash feels soft and buttery on the skin and makes a rich lather. Another thing I loved about this face wash is it washes off easily without making any film and leaves skin squeaky clean to touch and feel. I also tried this face wash to remove my stubborn eye makeup. And guess what? It removed all the fussy colors and glitter in just single application!! The product does a wonderful job of cleaning the skin. Coming out fair on most of its claims of detoxifying the skin of all black dirt and impurities, the face wash also offers a great value for its price. It is an amazing cleanser from Pond’s and is one of the best face washes for oily skin and for use in summers. If you are looking for a good face wash for oily skin or for summers, you can give Pond’s pure white deep cleansing facial foam with activated carbon a try. Will I repurchase: Yes, if I run out with my present tube for this summers. It is definitely not a product for winters. Hi! I’m currently experimenting with different pond products to know what suits my skin type. I’ve purchased pond’s cleansing gel and pond’s facial foam pure white, can I use them both or is it a bad idea? I’m planning to use the cleansing gel in the morning and then both at night.